It was standing room only at Amsterdam Bar and Hall in down­town St. Paul on a typically brisk November evening in 2014, and the venue’s all-ages crowd was abuzz. Three-pieced businesspeople chatted with tattooed entrepreneurs. Urban activists mingled with suburban moderates. College students camped out at tables near the stage. Everyone seemed primed for things to get started. Finally, after plenty of time for a beer run or three, Steve Seel, then a host and producer at Minnesota Public Radio’s rock ’n’ roll juggernaut 89.3 The Current, grabbed the mic to introduce the eve­ning’s entertainment. There would be no new underground band or fledgling singer-songwriter onstage this night, however. Instead, the DJ introduced a credentialed, three-person panel that had been brought together to share their perspectives on the economic, social, and medical changes that accompany the aging process. It was the sort of intellectually nourishing evening the Citi­zens League and MPR had hoped for a decade ago, when they be­gan imagining how to engage diverse audiences in the day’s most pressing issues. Instead of just another evening in a classroom or lecture hall populated by talking heads and predictable talking points, however, the planners behind Policy and a Pint® made it their mission to create a safe, inviting place to digest facts, exchange opinions, and access a sense of purpose and community. The 60- to 90-minute programs, which take place six times a year and often sell out, address a range of issues facing average Minnesotans, such as the state’s mental-health care system, the region’s changing transportation infrastructure, and the future of public education. 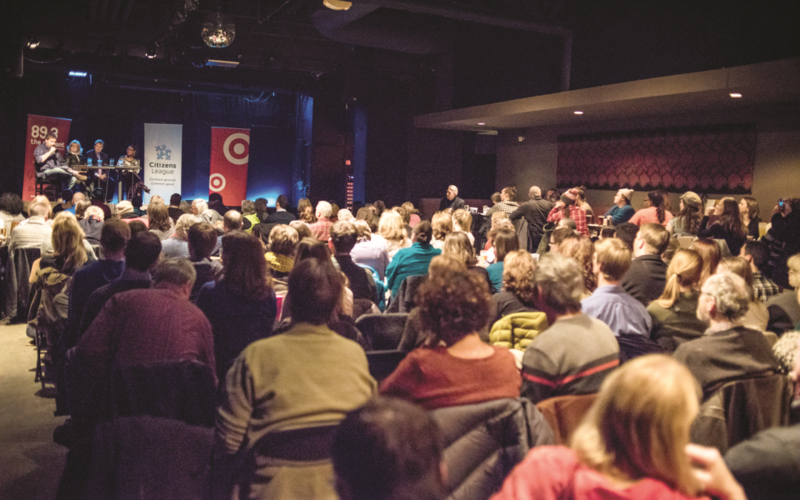 Thanks to the support of Target and the Bush Foundation, plans are already under way for 2018 (check out citizensleague.org/events for upcoming engagements), and MPR will continue to stream recordings of the events at thecurrent.org. Admission is just $10 ($5 for students), the appetizers are complimentary, and the cash bar is open from pre-curtain to final comments. So those who want to join in the search for solu­tions to some of today’s most puzzling policy questions should bring a thirst for knowledge along with an open mind, and plan to make some new friends.